Soldiers need their strength, and fighting terrorists to save Jewish lives trumps the custom not to eat meat this week, IDF Rabbis said. Soldiers in Gaza could eat meat during the coming days, the IDF Rabbinate announced Monday. The decision contravenes a widely-held Ashkenazi Jewish custom not to eat meat from the beginning of the Hebrew month of Av – which began Monday – until after the Fast of the Ninth of Av next week, during the period generally known as the "Nine Days." Sephardi Jews refrain from the start of the week in which the Ninth of Av occurs. The ban on eating meat, except for Shabbat meals, is a long-standing one, instituted after the Destruction of Jerusalem and the exile of the Jewish people from the Land of Israel, as a sign of mourning for the Destruction. Other customs prevalent during this period include not taking haircuts or shaving, not listening to music, and not attending parties or going to places of entertainment. 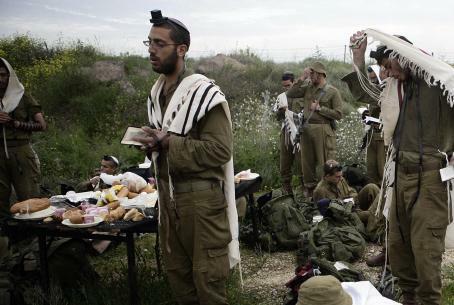 While soldiers are not exempted from the ban on haircuts or shaving – most don't have a chance to shave at the front anyway, said the Rabbinate – they could eat meat if they felt the need. Meat supplies protein and vitamins that are very difficult to get otherwise, especially under battlefield conditions, the Rabbinate said – and since soldiers need their energy and strength to fight Hamas terrorists, they were permitted to eat meat. However, those who felt they could manage without meat were certainly not obligated to do so, the Rabbinate added.